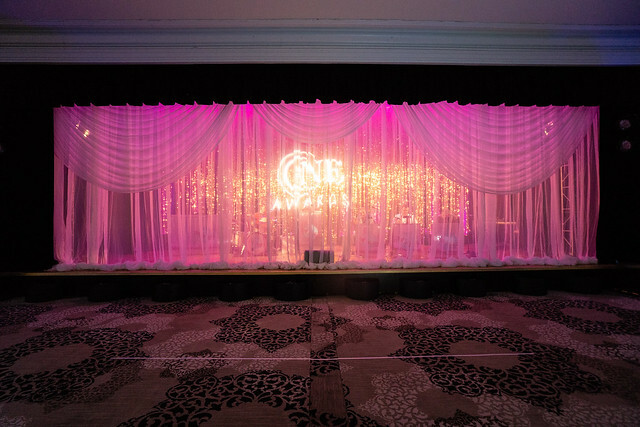 It always impresses us to see the unique and innovative ways our wonderfully creative clients utilize our rental theatrical stage drapes for their special events not just across the country, but particularly here locally in Southern California, too. With specialty curtains custom built right here in our LA sewing room, and always consisting of the highest quality IFR fabrics, Rent What’s Rental Specialty Drapery Collections carry a selection of colors, styles, and sizes to perfectly suite your own unique design needs. 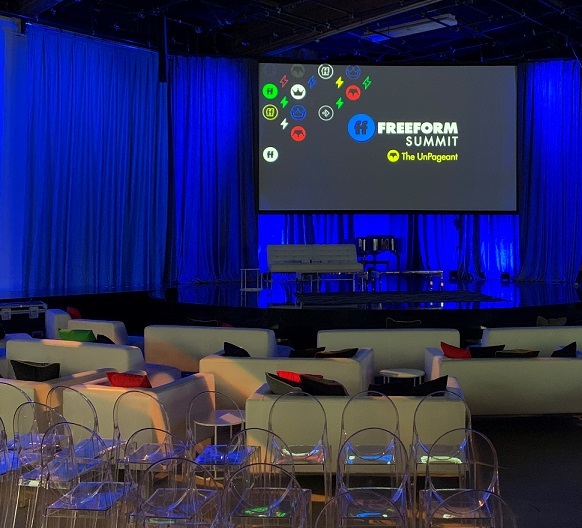 Recently, the exceedingly popular youth-culture television channel Freeform (previously known as ABC Family) had its second annual Freeform Summit here in Los Angeles at the renowned Goya Studios. This symposium, branded “A Stage For Everyone,” was a high-profile series of talks and meetings conceived to discuss its many network projects focusing on authentic storytelling, inclusion, and representation. We were thrilled to work with the fabulous event production company for this event, Big Time Operators, and especially their owner and chief designer Joseph Jensen. He came to us looking for a mix of gorgeous—and eclectic–rental drapes that would work as both a beautiful backdrop for the conference’s main speakers, while also offering the flexibility to customize the looks for various panel discussions throughout the day. Choosing drapes from our Timeless and Traditional Rental Drapery Collection, they started by using our velvety, luxurious Grey Super-Vel Pleated Drapery Legs as center panels that could easily be tied onto the venue’s light grid at unique intervals and angles, giving a distinctive dimensionality to the center stage. Next they chose our magnificent Pewter Textura Pleated Drape Panels to help extend the silvery “vibe” along the length of the wall, thereby crafting an irresistibly textured and completely polished look for this prestigious event’s overall motif. By simply adding some splashes of vibrant, colorful theatrical lighting onto this mix of curtains, they were able to construct a fresh, new look for every portion of the summit. As you can see, they did a fantastic job creating a memorable and energetic design with dazzling Rent What? rental drapes, spectacular lighting schemes, and a lively, youthful décor. 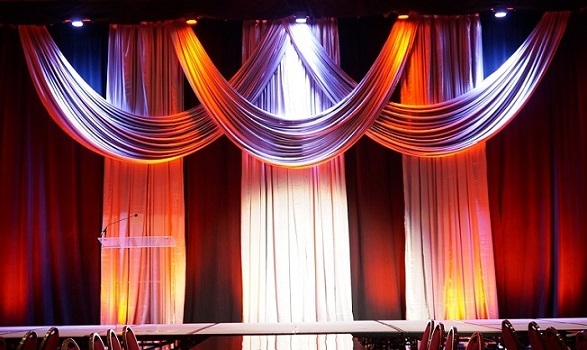 Let us help you to fashion a one-of-a-kind look for your own upcoming special event, tour, production, or trade show with our extraordinary rental or custom-built stage drapes, too! We love it when our clients “think outside the box” when it comes to designing their custom stages and productions using beautiful and eclectic drapes from our diverse rental drapery collections. Nothing pleases us more than when a client happily shares a story or an image with us from their recent successful event, showcasing some of our lovely rental curtains as part of their intricate and unique stage designs. 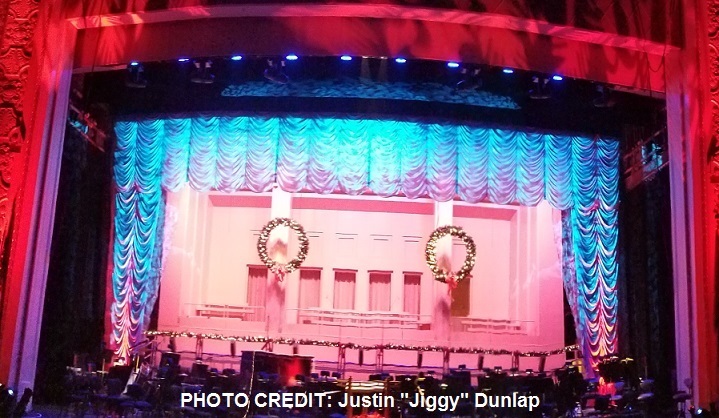 This past winter we were thrilled to work with Lighting and Scenic Designer “extraordinaire” Justin “Jiggy” Dunlap, who worked with the team at the always remarkable Oregon Symphony Orchestra on their unforgettable 20th Anniversary Gospel Christmas Concert. 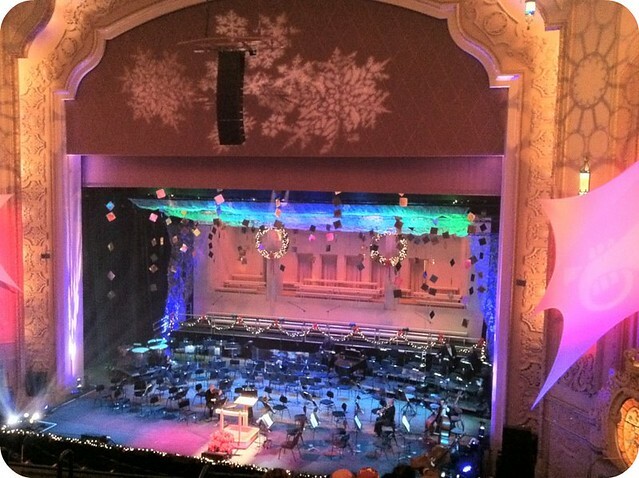 This special occasion was being held at the impressive Arlene Schnitzer Concert Hall (affectionately known to locals as “the Schnitz”) in beautiful downtown Portland, Oregon, and so Justin needed to create a magnificent design that would be memorable, festive, and adjustable enough to work within the many various sections of this wildly popular show. 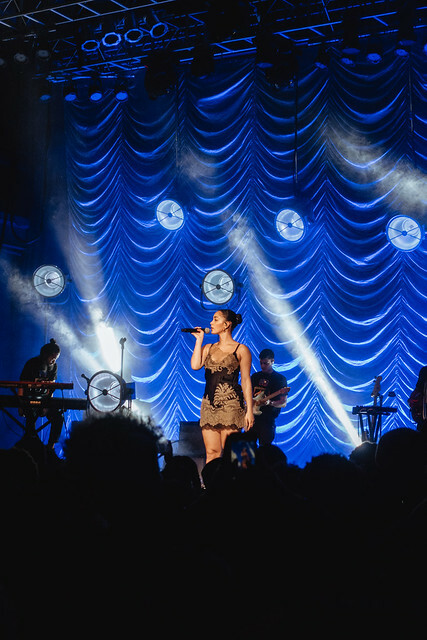 The venue’s larger-than-life stage demands nothing less than ultra-dramatic décor and lighting, so using some of our stunning rental drapes worked perfectly to do this. Starting by building a proscenium frame downstage with Austrian Zip-Walls from our Silver Satin Collection, he gave the stage a striking elegance that put everyone in the holiday spirit from the get-go. 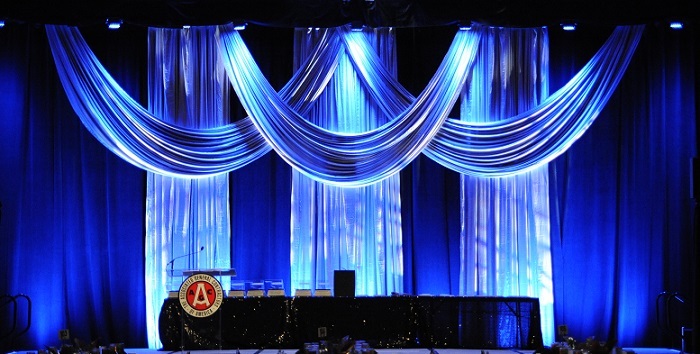 Justin used our 30’h x 16’w Silver Satin Austrian Zip-Wall drapery to outline the proscenium, and then innovatively used some of our 12’h x 10’w Silver Textura Austrian Zip-Wall drapes as a fabulous “border” along the top of the proscenium, to help give it all a very clean, coordinated look. He then enhanced the look with an edgier, extraordinary design upstage by framing the orchestra with a 4’h x 50’w border and 28’h x 10’w legs in Metal Mesh, from our Industrial Textures Collection. Embellishing the stage with holiday decorations and gorgeous theatrical lighting and gobos, Justin was able to deliver a thoroughly joyful vibe to the enthralled audience. 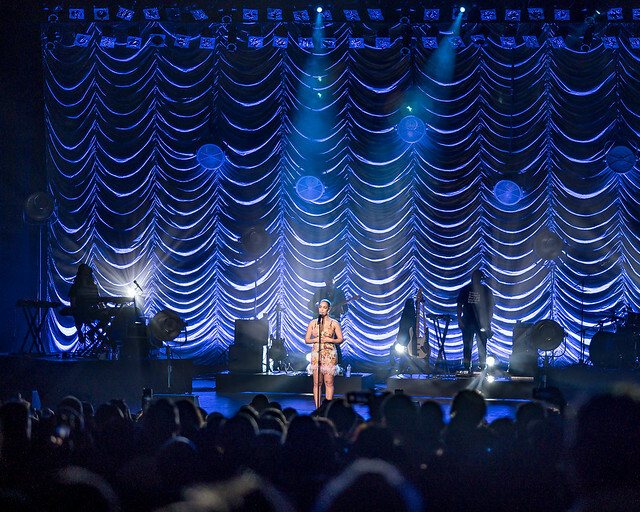 This combination of unique rental drapes helped give their stage a completely one-of-a-kind, fresh look for various parts of the concert. These different—yet complimentary—styles of drapery are both easy to hang, light up spectacularly, and never disappoint! Rent What? was so excited to be a part of this outstanding production again this year, and we genuinely look forward to working with Justin again on his next breathtaking stage design. 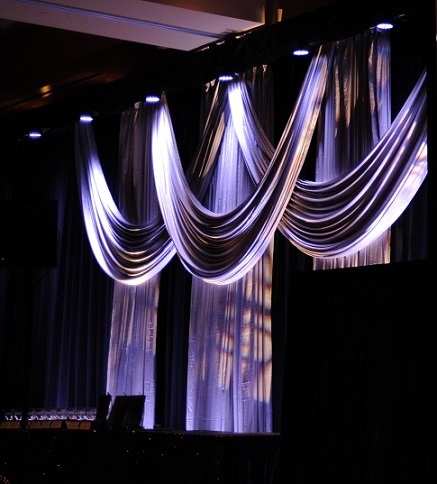 Don’t hesitate to reach out to one of our sales reps to see how we can help you create a fabulous look for your upcoming special events with dazzling curtains from our rental drapery collections, too. 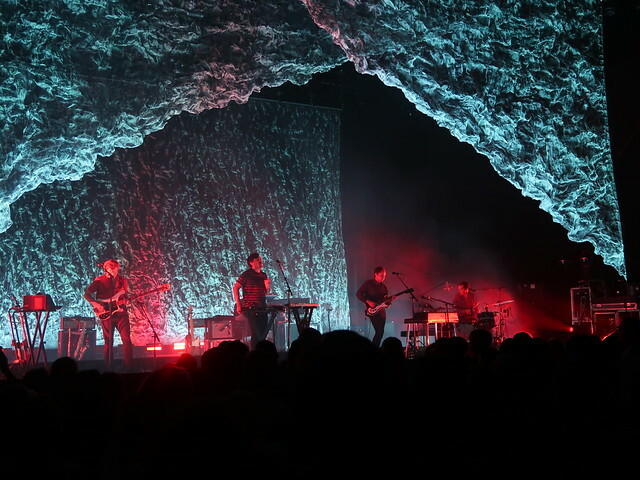 Our clients contact us all the time looking for options and suggestions of some stunning theatrical curtain ideas for their upcoming special events, concert tours, trade shows, and stage productions. One of the most effective ways we’ve been able to assist them with gaining valuable inspiration for stage design ideas is suggesting that they take another look at our always-expanding Flickr Galleries. 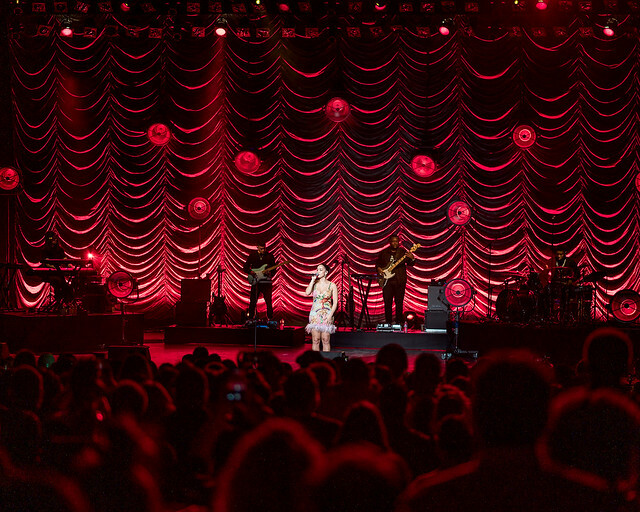 Showcasing all kinds of images—including custom-built grand stage drapes and digitally printed backdrops being used on international concert tours, to local awards banquets needing a little extra flair with a few of our beautiful rental curtains, to just about everything else in between—there’s a little something for every type of stage design you can think of. We know that occasionally “seeing is believing” when it comes to creating a one-of-a-kind look for your own special event or show, and that sometimes inspiration can simply come from viewing a beautiful picture. Our SW?/RW? 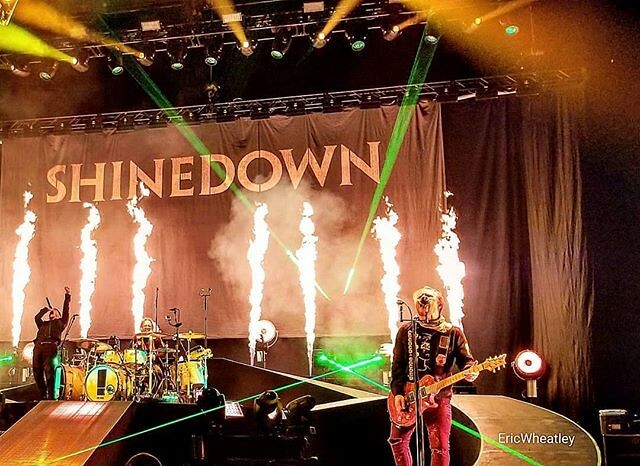 team is excited to share photos from fans and photographers around the world who have been moved to snap a few pics of their favorite artists and bands, and then share them with others eager to check them out as well. Collecting them all into easy-to-navigate photo galleries helps make it effortless in assisting you to find your own next event design using our gorgeous rental drapes and striking custom curtains, too. Next time you’re working on your big or small productions, concerts, trade shows, or other special event designs, why not take another glance at our SW Flickr Gallery, and see what fantastic stage drapes might catch your eye…..Then give us a shout and we’ll be happy to help bring those design visions to life for your production, too!